The wedding proposal is the first step in the wedding planning process. A romantic proposal will set the tone for the wedding and the wedding planning. It will also be an event that the bride and the groom will remember for the rest of their lives, as it is the first step to committing themselves to each other and their love forever. 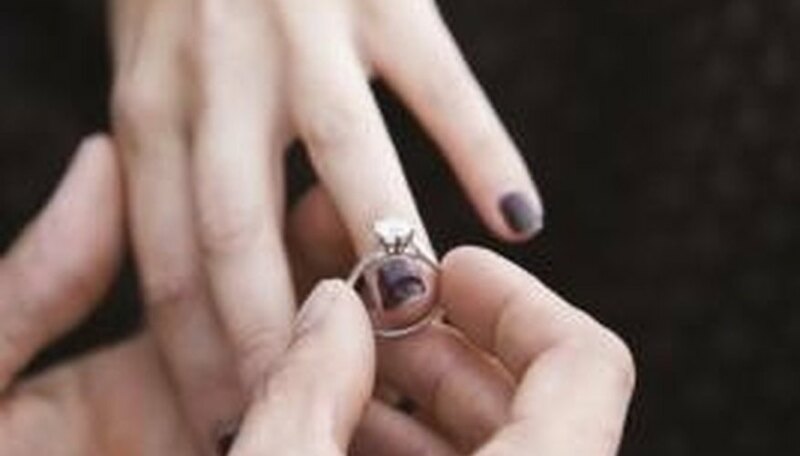 The ring is the centerpiece of the wedding proposal. Choose a location that is meaningful to the two of you as a couple as the site for the wedding proposal. This could be the site of your first meeting, the place you went on your first date or the location of your first kiss. As a prelude to the actual proposal, take her hand and talk to her about your memories of that place and why it is special to you. Get down on one knee and pull out the ring. Explain to her that you from the first time you were at this spot together you knew she was the one for you. Present to her the ring and ask her to marry you. An exotic or exciting trip can make for a romantic and even passionate wedding proposal. Plan to ask your mate to marry you as you vacation at a tropical island, in a foreign country or on an adventurous trip. Choose a location at your destination for the wedding proposal. This could be as you watch the sun set over the ocean on the beach, as you tour an ancient castle or on a rugged mountain top. Tell her you want to share life's adventures and travels with her by her said as you reveal to her the engagement ring. Choose a mystical and natural location for your romantic wedding proposal. This could include an elaborate rose garden or even a garden in a butterfly conservatory. Find a secluded corner amidst colorful flowers or fluttering butterflies, making the scene that much more magical and whimsical. Drop to one knee as you pull out the ring. The surreal and romantic setting will make the proposal one that will live in her memory for decades to come. Coordinate a weekend getaway to the city, such as to Boston, Chicago or New York City. Take her out for a romantic dinner and suggest a stroll amidst the city lights and bustle. If visiting New York City in the winter season take her to see the Rockefeller Christmas tree and to watch the ice skaters around Rockefeller Center. As you stand beneath the sparking lights, cuddled together for warmth, remove her mitten and present her with the wedding ring, for a romantic and metropolitan proposal. Barry, Michelle. "Most Romantic Wedding Proposals." Dating Tips - Match.com, https://datingtips.match.com/romantic-wedding-proposals-7953364.html. Accessed 23 April 2019.